Unicorn, the visual art imprint of Unicorn Publishing Group LLP, is pleased to announce that it has reached an agreement with Provo, Utah, artist Brian Kershisnik for an October 2018 publication of a retrospective art solo, Looking for Something: his first for over a decade. Acquired by Unicorn's Chicago office, Kershisnik is one of the Western US’s most beloved and collected artists, with a deceptively simple “faux-naive” style through which he looks at some of life’s most complex mysteries. His figurative work explores a bewilderment of life with a mixture of melancholy and play that feels deeply and encouragingly human. 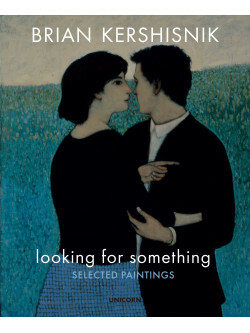 Looking for Something will include more than 200 color images of Kershisnik’s most popular paintings as well as text that puts his work into the larger context of his age. Kershisnik is a puzzling and puzzled explorer; both a part of, and separate from, his contemporaries. He is an enthusiastic and optimistic examiner of triumphs and tragedies. He exposes the common in the hero and the heroic in the quotidian. He aspires more to the richly human warmth of Giotto than the remote and otherworldly, if impressive, brilliance of the high renaissance. His work is made by his life and is meant to be lived with. Don Linn of Unicorn says "We at Unicorn are extremely pleased to be bringing Brian's work to a broad audience this autumn. Brian's paintings are not only beautifully executed pictures, but they also explore some of life's great wonders and questions with wit and playfulness. Both those familiar with his work and new audiences will be surprised and delighted with this collection." Kershisnik is collected worldwide and publication of Looking for Something will be supported by a major marketing and publicity campaign. The book will be available for pre-order in the near future.